Special Containment Procedures: SCP-109 is currently located in Non-Critical Storage Unit 7 and requires no active monitoring. It should not be removed from the unit except to be transported to a research facility, and then only by personnel with Level 3 security clearance or higher. When replacing SCP-109, personnel should ensure that it is firmly closed and that it is placed on the molded pedestal in the upright position. 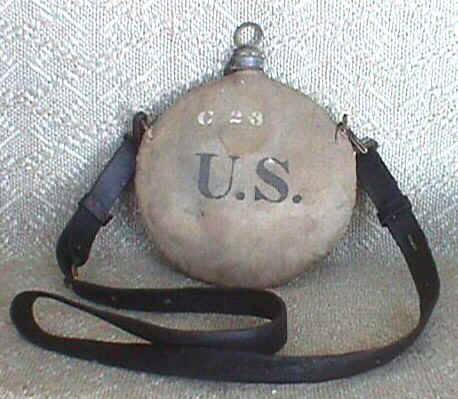 Description: SCP-109 is a standard-issue United States Army canteen (circa 1899) made of a tin alloy and fitted with a heavy cotton cover and a black leather strap. When opened, the item is seen to be nearly full of water. A seemingly unlimited amount of water can be removed from the container without changing the water level or the item's mass, which remains a constant 3.16 kg. Probes of the interior of the container reported an estimated volume of 2.8 L and a shape consistent with the outside. The water in SCP-109 is of a slight blue-gray tint, with concentrations of 20 ppm of tin and 170 ppm of other electrolytes. The water remains at a constant temperature of 19°C but can be heated or cooled when moved to another container. Addendum 109-1: Upon the item's delivery to Site-19, it was given the object class of Safe. As tests were conducted on the item, uncertainty surrounding test results prompted Gen. ████████ ████ to upgrade the object class to Euclid. Addendum 109-2: Recently, a request was filed and granted by Dr. ████████ for permission to water an okra plant growing in his office with SCP-109. Staff should be notified that Dr. ████████ uses SCP-109 for this purpose for a small time every Friday. Additional Information: Due to the range of tests conducted on SCP-109, this section has been provided to present test results in chronological order. Dates have been withheld for confidentiality. TEST 1: Subjects imbibed water from SCP-109, reported that it was very refreshing and, despite the metal content, very tasty. Urine samples from subjects were normal. TEST 2: Follow-up test to TEST 1 had subjects dehydrate themselves for 1 full day before imbibing water from SCP-109. Test remains unfinished as subjects were unable to provide urine samples. TEST 3: Subject bathed in water from SCP-109. Subject reported increased energy and a much improved complexion following the bath. TEST 4: Streptococcus bacteria cultured in water from SCP-109 thrived and multiplied quickly. Water from SCP-109 administered to subject suffering from streptococcal infection killed nearly all bacteria and produced a full recovery within 24 hours. TEST 5: Blood substitute created using water from SCP-109, given in transfusion to pedestrian hit by a drunk driver. Subject showed no malign symptoms from the transfusion and made a full recovery. Subject's physical therapy concluded six weeks early. TEST 6: Water from SCP-109 administered to various plant organisms, all of which remained very healthy and showed no malign symptoms. One proposition for a test which has been discussed for some time has been one involving a combination of SCP-109 and SCP-402. Due to the risk of losing one or both items or creating a hazardous situation, this test has never been conducted.